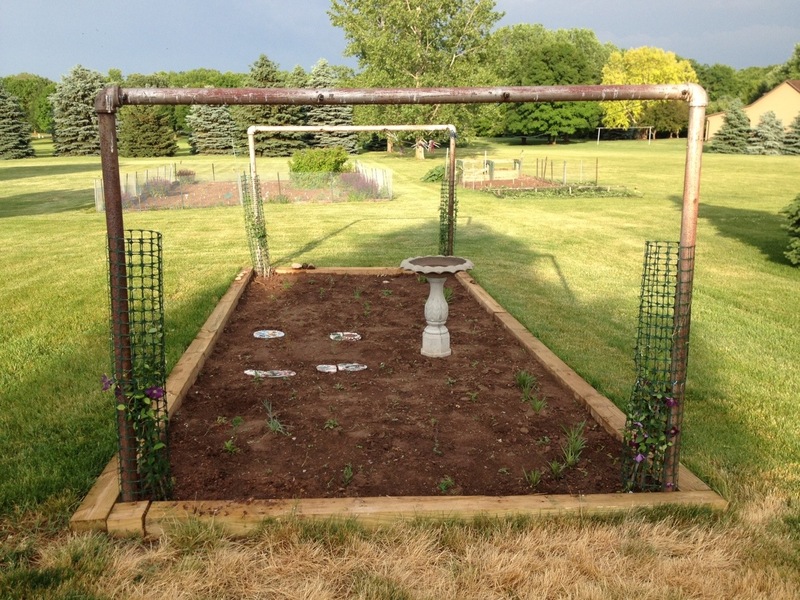 All in all, my clothesline flower garden turned out pretty well. I’m thinking this is Goat’s Beard. Am I wrong? Late-summer rain helped the clematis bloom pretty purple flowers. This corner of the flower garden got pretty crowded with celosia and columbine, as well as a few weeds. Is the white weed called yarrow? I spent the better part of this week taking photos of my flower garden and trying to figure out which perennial flowers actually came up this summer. No easy task given that flowers are not my thing. I can identify everything that comes up in my vegetable garden, whether it’s peas, beans, lettuce, carrots. Once I plant, I have no problem telling the difference between a vegetable and a weed. Flowers, however, are different. When I started plotting out the flower garden, I cut out photos and placed them on a dry-erase board to get an idea of what I needed to buy. I kept the board to use for the actual planting and at some point realized I probably should keep it around to help remind me what flowers were planted where in the garden. Last winter, when I started thinking about turning the area beneath my clothesline into a flower garden, I had high hopes. But I also was a bit uncertain as to whether I could pull it off. I was excited to pick out and order the perennials, but in the days after I planted the bulbs, the nervousness returned. Almost all of them looked like they were in a deep sleep from which they might never awake. Fortunately, words of encouragement from my sister helped me chill out, and whaddya know, they seem to have made a comeback. In fact, most are doing quite well. I’m not sure I’ll have actual flowers this summer, but there is a lot of green and that keeps me thinking positively. 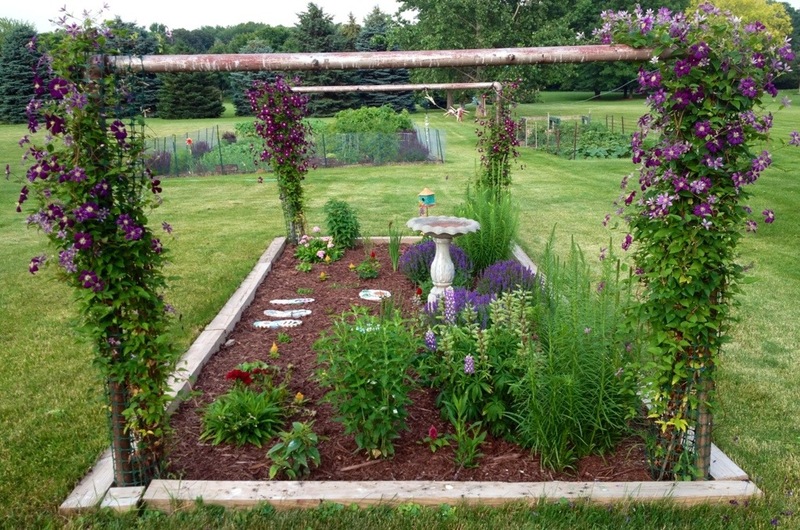 My “vision” for the flower garden also included incorporating the clothesline poles into the design. I mean, why leave the poles in the ground if they were just going to stand there looking out of place, all rusty and abandoned? In a little more than a week, the biggest storm of the winter is a distant memory. Since the snowfall on March 2, we’ve had three days with highs in the 40s and 50s, and another three in the 60s (counting today). What’s more, highs for the next six days are expected to be mostly in the mid- to upper 60s, and Wednesday could warm up into the low 70s! True shorts weather in March! With average high temperatures this time of year in the mid-30s, the warmth of late is nothing short of unbelievable. So, Sunday afternoon I walked the backyard – definitely a bit easier than last week’s venture in the snow. Picked up the trash that had blown under bushes, checked out some of the shrubs and raspberry bushes, and tried to fill in the holes where Chloe (our beagle) had already started digging.